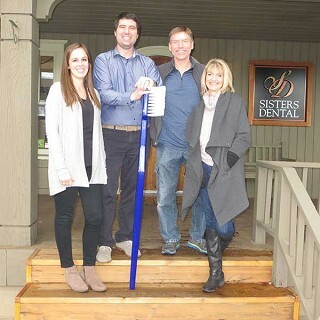 In what he describes as a "win-win-win," for both dentists - and most of all for their patients - Dr. Everson will continue to practice, but reducing his days/hours to spend more time with family; Dr. Frideres will see patients at both offices for the next few months, while looking forward to being able to offer more hygiene appointments and more flexible scheduling options. After a period of construction, the united practices will be located at the current Everson building. Construction is expected to be complete by early autumn 2019. Dr. Frideres hails originally from Montana, where many members of his family are involved in medical professions. He found is way on a roundabout path into dentistry. "I tried a lot of things," he told The Nugget. "I was actually thinking of going to medical school, but it didn't fit right with me." He worked for a time as a pharmacy tech, but "I missed the patient aspect in the pharmacy," he recalled. He took an introductory course in dentistry at OSU Portland, and something clicked. Dentistry offered the connection with patients and an "engineering and math" aspect that he really liked. "It fit right; it felt right - it just fell into place, honestly," he said. As part of an agreement for student loan forgiveness, Frideres practiced dentistry in the underserved area of Moses Lake, Washington. Located "an hour-and-a-half from everything," the relative isolation of his practice there meant that he saw a wide variety of dental issues and had to deal with them in-house - invaluable experience for a young dentist. His wife, Kylie, a therapist, has family in Bend and Redmond. When it came time to decide where they wanted to establish a practice of their own, visits to Central Oregon came back to mind. "Every time we'd come over Santiam Pass and came through Sisters, I'd say, 'I love this town!'" Dr. Frideres said. "'This is the town where I'd like to live.'" Family-oriented, with a love for the outdoors and small-town living, Sisters seemed like the perfect place - and it has proved out. Dr. Frideres looks at dentistry as a "whole health" matter, and emphasizes families and taking care of patients of all ages. He's had lots of experience with kids and enjoys working with families. "We love to have whole families come in," Dr. Frideres said. Dr. Frideres considers his philosophy of dentistry to be strongly evidence-based, emphasizing best practices over longstanding traditions. "He really likes to keep up with what the research is saying," Kylie Frideres noted. As an example, Dr. Frideres said that many people have concerns about health effects of amalgam fillings and that sometimes there is a push to remove and replace them. He notes that scientific evidence accumulated over many years indicates that they are not problematic and that there is no need to replace them. He's happy to share that research with his patients - and then let them make an informed decision. He's also done a lot of research into Silver Diamine Fluoride (SDF), which is used to arrest cavity development and kill cavity-causing bacteria. He notes that this can have beneficial intergenerational effects as "the bacteria in your mouth is picked up from the people you're around the most." The Frideres are young and active, enjoying a wide range of outdoor activities, including skiing, rafting, snowshoeing and hiking. And Trevor plays hockey in a league in Bend. "Hockey's been my sport since I grew up," he said. "I don't know why." His NHL team is last year's Stanley Cup champions, the Washington Capitals - ever since his mother took him to a Capitals game while in DC for a medical conference. For more information on Sisters Dental and the merger with Dr. Everson, call 541-549-9486.